Representatives of Romania's Presidency at the EU Council and those of the European Parliament (EP) reached an informal agreement on Tuesday regarding a directive proposal establishing the norms facilitating authorities the access to enforce the financial information law, in view of preventing, uncovering and investigating certain offenses. According to the Press Bureau of the Interior Ministry (MAI), the informal agreement will be presented in the shortest time possible to the EU ambassadors for confirmation on behalf of the Council. 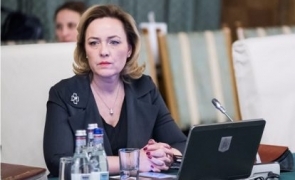 Interior Minister Carmen Dan highlighted that perpetrators are able to carry out very quick transfers via bank accounts in several countries, referring to both funds used to fund certain offenses and funds that have been illegally obtained. "We have to make sure that the law enforcement authorities can take action even faster in these cases. The new rules which have been provisionally agreed today will provide the law enforcement authorities a clear framework in order to access and exchange financial pieces of information," she pointed out. The money laundering directive, which is currently in force, imposes member states to set up centralized bank account registers or data recovery systems to allow the timely identification of persons holding bank and payment accounts, as well as safety deposit boxes. Moreover, it provides the direct access to information included in these registers to financial information units. "The new rules impose member states to assign certain authorities in charge (including at least the asset recovery offices) that can directly access financial information and request information or analysis already obtained by the financial information units, with the assigned authorities being notified to the Commission," the quoted source said. According to the quoted source, the member states should also consider that these relevant authorities may also directly and immediately access and seek pieces of information regarding the bank account, in view of facilitating the prevention, detection, investigation, if needed, the criminal prosecution of certain offenses. The authorities of the member states should also make sure to request the financial information units to cooperate with the relevant authorities, being able to respond in a timely manner to the requests regarding financial information or analysis coming from the respective authorities, if they consider it appropriate. In addition, the designated authorities should respond in a timely manner to the information requests of the national financial information unit and the financial information units of various member states shall have the right to exchange information in exceptional and urgent cases related to acts of terrorist or organized crime associated with terrorism.